I recently took part in the #MonetaParty hosted by the Triple Stitchers made up of Rachel, Abigal, and Elle . 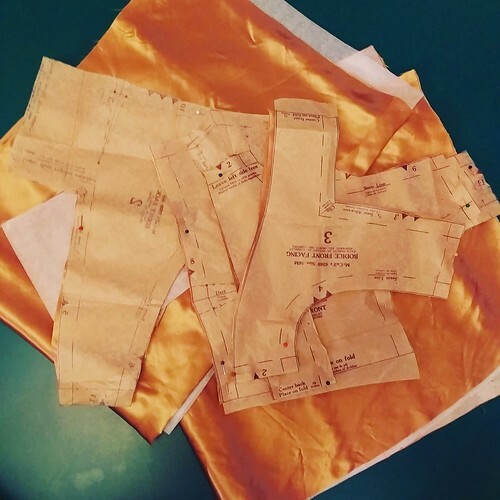 The idea was that all participants sew up the Moneta dress by Colette patterns and share their makes on Instagram. At first, I wasn’t sure if I wanted to participate after all the Moneta dress is just a simple knit dress. However, I after exploring Colette patterns website I found a free collar extension pack for this pattern. The collar variations really added to this dress. I was especially taken by the tie collar and how it gave the dress a bit of a retro nautical inspired look. Along with the tie collar, I also made the largest size skirt and then gathered it. It gave the skirt a much fuller look than the more relaxed fit of the original dress. The length of the skirt I cut as directed, but I’m short so I feel like it seems longer to me than most of the Moneta’s that I see online. With that said, the fuller skirt and longer length also help to give this dress more retro appeal. 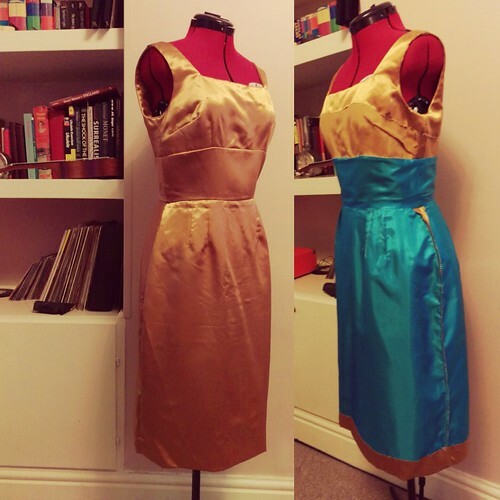 The Moneta dress is so easy to make and I managed to sew it up in around 4 hours. While it might be simple, a few additions really give this dress the retro style I love. 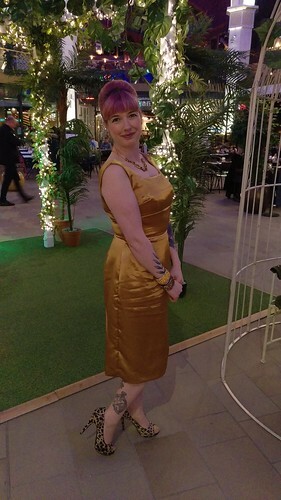 I had to go to a wedding last weekend and used it as an excuse to try out these two patterns – Simonetta Dress, and Vogue Coat. I seem to always buy a-line empire line dress patterns as its a style I think suits me – and I have now decided that the Simonetta dress is the best ever – I think its the wider shoulder (it extends out but no shoulder pads), as it gives a flattering line (for the pear shaped). The dress for the wedding I made in a gross grain, and I did run up a ‘wearable’ muslin from a curtain scrap (so I now have 2 nice dresses). The cut of this dress is simple and very effective, the front seam has a curve in it, as do the darts. The collar was tricky only in that I had never done one like this. Its basically 2 strips of bias, folded, and steamed into a curved shape. The coat is in a cotton. I had wanted to make a casual summer coat so went with a neutral colour and casual fabric. I did interline it as the fabric creased like linen (and looks like linen), but did not interline the sleeves (1, because its a summer coat and 2, because I didnt think the bias would hold creases). 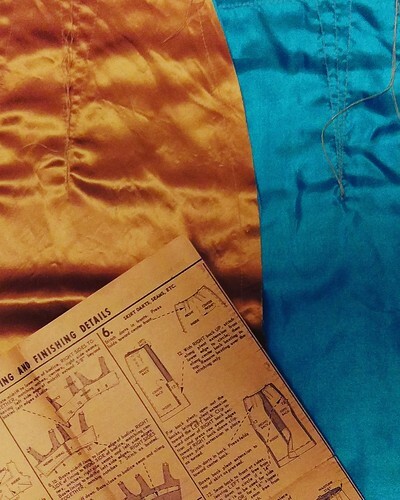 I was rather cheap and interlined with light sew-in basting, I don’t interline a lot, but if I was able to locate it (I wasn’t), I would have preferred to have used hankerchief cotton or a voile. The only really technical bit about the coat was the use of ‘pad stitching’ in the collar. I had never done this before and so referred to the wonderful Allyne Bane book and it was all clear. I only did a medium amount of pad stitching, and it serves well. after the pad stitching, I did baste the collar roll line in place and left this stitching in until the final steam. Even though its a casual coat, I think the sit of the collar is gorgeous – I notice it in the wearing as it sits away from the neck and it really feels like the coat hangs from the shoulders…..I dont know if I am explaining this correctly, but it feels exactly what is perfect for an evening or summer coat, and I dont think I ever had a coat that sat like this, which is another fabulous reason to sew vintage/sew your own! I do have a blog – upsew.ie if anyone wants to see other projects, – but I have pretty much replicated the post here! 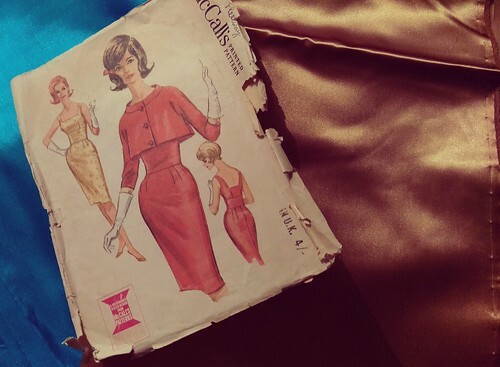 I picked McCalls 6569 for the pattern; a gorgeous sixties evening dress. The first thing I did was post in the We Sew Retro Sew & Tell facebook group to ask for tips, it’s one thing I LOVE about the sewing community, you have a wealth of experience and advice online in a group like that and people are only willing to help and wish you luck. So armed with my new found advice I bit the bullet and cracked on. 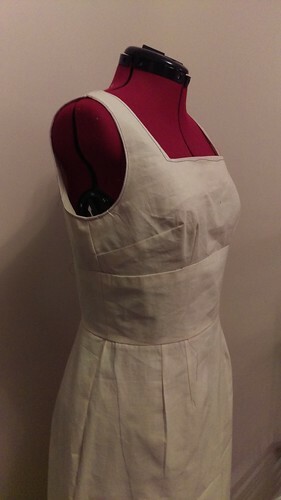 As you may have noticed if you read my blog, I don’t often make muslins of my clothes but as I was working with an unforgiving fabric I thought I probably should get it right the first time, as a seam ripper might not be the best friend it previously had been to me. I measured up, perfect in the bust but 2 inches bigger on the waist and 4 on the hips (not live I’ve had a baby in the last year or anything….). It was going to need a little adjustment. 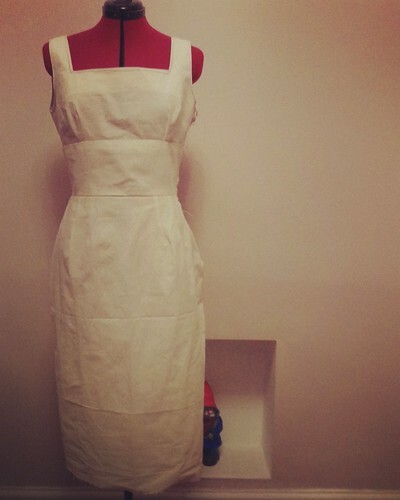 To read more about the adjustment process and how I sewed my muslin up pop over to my blog. So on to the dress…. I then spent a long night sewing the lining to the skirt pieces following this, and here was where I made one of my major mistakes. I have no idea how I marked the fabric up wrong but somehow I managed to. When it came to the later stage of sewing it together it meant that I had a row of stitching down the back of the skirt next to the centre seam which I then had to unpick. With a day to go to my anniversary (and after a lengthy trip to the dentist for two fillings) I spent a full day sewing the skirt pieces together. I attached the skirt to the bodice with relative ease and inserted the zip. Mistake number two: I was silly enough to not check that the fabric was taught when I basted the zip in, meaning that when I went to sew it I, again, had a big chuck of stitches to unpick which left a rather messy side zip insertion.